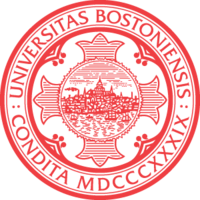 Boston University (BU) is a private research university located in Boston, Massachusetts, United States. Although chartered by the Massachusetts Legislature in 1869, Boston University traces its roots to the establishment of the Newbury Biblical Institute in Newbury, Vermont in 1839. The University organized formal Centennial observances both in 1939 and 1969. 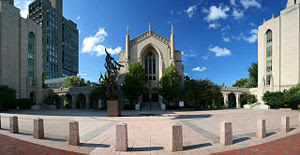 "Boston University began as a Methodist seminary in 1839 in Vermont. The school was transferred to New Hampshire in 1847 and to Boston in 1867. It is now internationally recognized as a top institution of learning and research. Our faculty includes Nobel laureates, MacArthur Fellows, leading scientists, prize-winning authors, and many more valued scholars. Throughout its history, Boston University has stayed true to its founding mission of providing an excellent education and helping students become valuable members of society. Our most famous and respected alumnus, Dr. Martin Luther King, Jr., exemplifies the spirit of community and innovation that pervades our campus"
With more than 3,000 faculty members and nearly 30,000 students, Boston University is the fourth-largest private university in the United States of America and the city's fourth-largest employer. The University offers bachelor's, master's, and doctoral degrees through 18 schools and colleges and operates two urban campuses. The main campus is situated along the Charles River in Boston's Fenway-Kenmore neighborhood, where it is bisected by the Massachusetts Turnpike. The Boston University Medical Campus is in Boston's South End neighborhood. The University's main Charles River Campus follows Commonwealth Avenue and the Green Line, beginning near Kenmore Square and continuing for over a mile and a half to its end near the border of Boston's Allston neighborhood. The Boston University Bridge over the Charles River into Cambridge represents the dividing line between Main Campus, where most schools and classroom buildings are concentrated, and West Campus, home to several athletic facilities and playing fields, the large West Campus dorm, and the new John Hancock Student Village complex. As a result of its continual expansion, the Charles River campus contains an array of architecturally diverse buildings. The College of Arts and Science, Marsh Chapel (site of the Marsh Chapel Experiment), and the School of Theology buildings are the university's most recognizable and were built in the late-1930s and 1940s in collegiate gothic style. A sizable amount of the campus is traditional Boston brownstone, especially at Bay State Road and South Campus where BU has acquired almost every townhouse those areas offer. The buildings are primarily dormitories but many also serve as various institutes as well as department offices. From the 1960s-1980s many contemporary buildings were constructed including the Mugar Library, BU Law School and Warren Towers, all of which were built in the brutalist style of architecture, drawing mixed opinions. The Metcalf Science Center for Science and Engineering, constructed in 1983, might more accurately be described as Structural Expressionism. Morse Auditorium, adjacent, stands in stark architectrual contrast, as it was constructed as a Jewish temple. The most recent additions to BU's campus are the Photonics Center, Life Science and Engineering Building, The Student Village (which includes the FitRec Center and Agganis Arena), and the School of Management. All these buildings were built in brick, a few with a substantial amount of brownstone and have been praised for successfully combining elements of old Boston (brownstone, brick, and federal architecture) with contemporary elements. U.S. News & World Report ranks Boston University 57th among national universities. Boston University was also ranked 20th among U.S. law schools, 34th among medical schools, and 41st among business schools. The Biomedical Engineering Graduate and Undergraduate Programs are ranked #7 and #8 respectively in the nation and rising by U.S. News and World Report. The undergraduate program is also the sixth largest ABET-accredited program in the nation. The Financial Times ranks Boston University's MBA program as the #45 U.S. School for Career Progress. Business Week ranks Boston University's MBA program #15, and its undergraduate business program #37. "The Professional Ranking of World Universities" conducted by the Ecole des mines de Paris, ranks Boston University the 34th best school in the world and 15th best in the U.S. for the professional future of its alumni. Newsweek (International Edition), in its August 2006 list of the Top 100 Global Universities, ranked Boston University the 35th best university in the United States, and 65th best in the world. 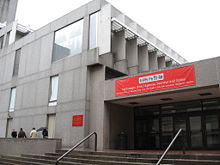 The Institute of Higher Education at Shanghai Jiao Tong University ranks Boston University 47th best overall university, and 45th best undergraduate university in the United States (two schools ranked above BU are graduate schools only; UCSF and Rockefeller), as well as 81st best in the world, on its list of the Top 500 universities in the world. The Center for Measuring University Performance ranks Boston University among the top 50 research universities in the country. The Wall Street Journal ranks Boston University's MBA program 41st nationally and the Information Technology department is ranked 10th in the world for academic excellence (September 2005). Forbes ranks Boston University's MBA program 46th among domestic MBA programs (August 2005). They also ranked Boston University as the 25th most Entrepreneurial college in America.